Scariest Star Wars bad guy? For me, it’s Darth Maul. He’s creepy-looking, he’s got a double-bladed light saber, an oddly soothing voice, and he always seems to appear out of nowhere! His theme music (not “Duel of the Fates,” but the whispery, hissing one) is pretty scary too. I’ll admit that his story takes a strange arc in Clone Wars (C’mon… Who can survive being cut in half?! ), but his insane lust for revenge and creepy, garbage-spider body makes him even more terrifying. Poor Satine! The fact that he’s part of an intricate, secret, diabolical plan that has been in motion for a while, is also unsettling. If anybody could bully me into carrying out Lord Sidious’s wishes, it would be Darth Maul. But… only if he lets me ride on his cool scooter first. 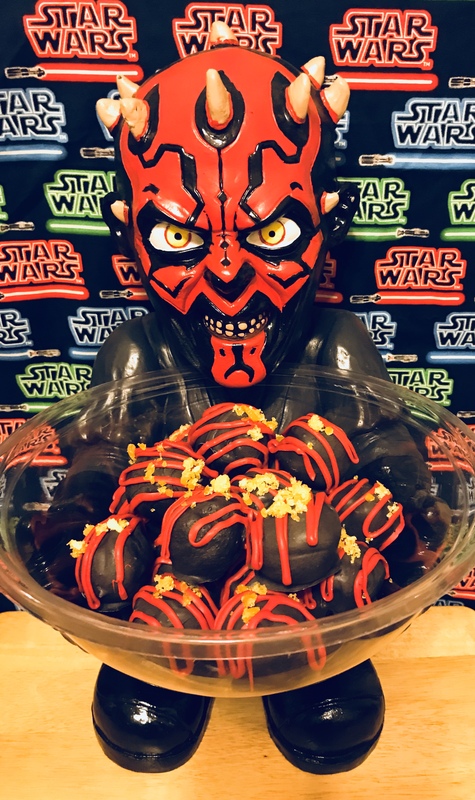 In the spirit of the season, here’s a recipe inspired by the Star Wars character that scares me the most. See you in my nightmares, Maul. 1. Line a baking sheet with wax paper, and set aside. 2. Crumble a prepared red velvet cake into a large bowl. 3. Add cream cheese and mini chocolate chips, and stir until well combined. 4. Scoop the mixture out by rounded tablespoonfuls, and roll into 1″ balls, placing them on your prepared baking sheet. 5. Once you’ve used up all of your cake mixture, chill the balls in the fridge for about 30 minutes. 6. While your balls are chilling, nuke the black candy melts in a microwave-safe bowl at 30 second intervals, stirring after each interval. 7. Using a fork, dip each cake ball into the melted black candy melts, and place back on the wax paper. 8. Place candy-coated cake balls back into the fridge for another 15 minutes. 9. While they’re chilling, nuke the red candy melts in a microwave-safe bowl at 30 second intervals, stirring after each interval. 10. Drizzle each candy-coated cake ball with melted red candy. 11. Immediately sprinkle each one with crushed butterscotch candies, and place them back in the fridge until the candy is hardened, about another 30 minutes. 12. Remove from the fridge and enjoy while wielding a double light saber. Happy Halloween!! This entry was posted in Recipes and tagged use the forks by blastpointspodcast. Bookmark the permalink.